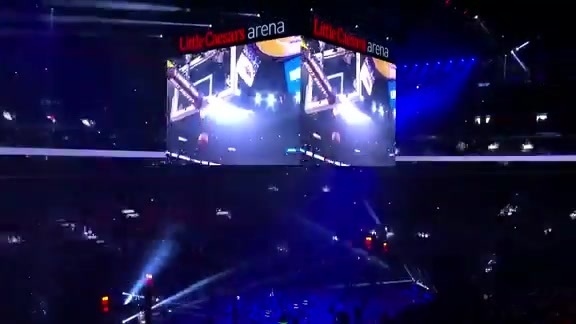 Check out the team intros for the first ever playoff game at Little Caesars Arena. 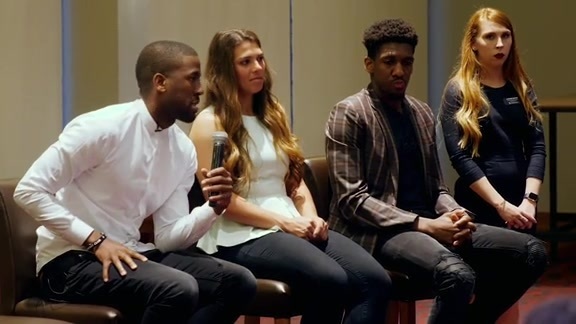 Detroit Pistons guard Langston Galloway joined a panel on mental health and wellness in athletics during the team’s recent visit to Oklahoma City, organized by Player Development Coach JD DuBois’ non-profit organization, Everyone Has a Story. 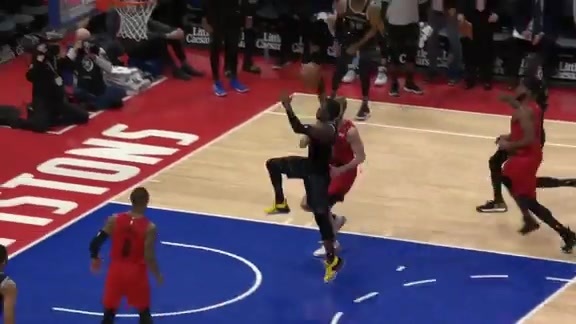 Ish Smith delivers a nice bounce pass to a cutting Glenn Robinson III for a dunk in this week’s Delivery of the Week, presented by Meijer! 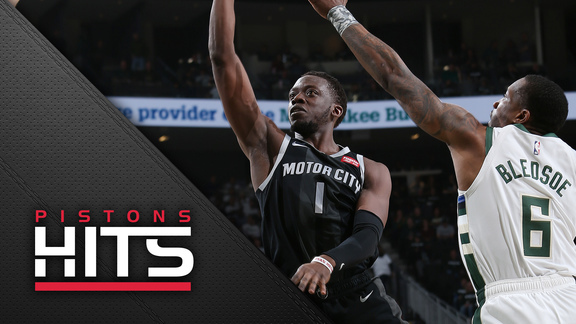 Time to get ready for Game 3 and the first ever Playoff game at Little Caesars Arena with this edition of Pistons Hits! 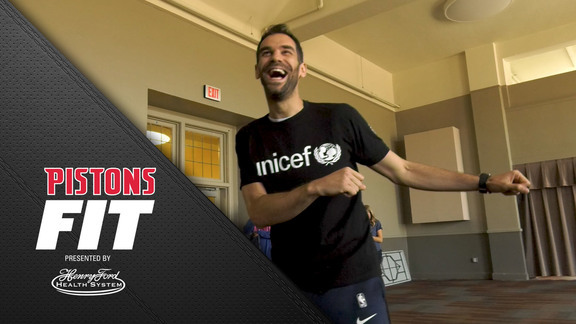 Students at Detroit’s University Prep Science and Math Elementary danced and exercised their way to a very special visit from Pistons guard and UNICEF Spain Ambassador Jose Calderon. 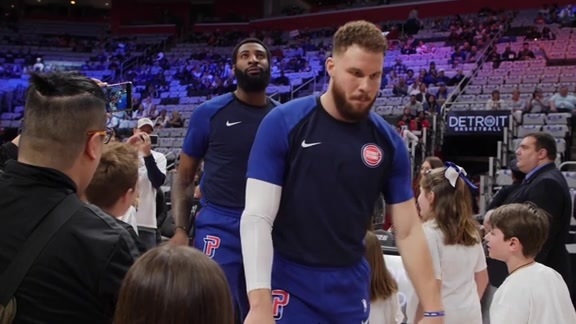 They were rewarded for their efforts in helping UNICEF save lives around the world as part of the Pistons Fit, presented by Henry Ford Health System. For more info on how your students can help, visit unicefkidpower.org. 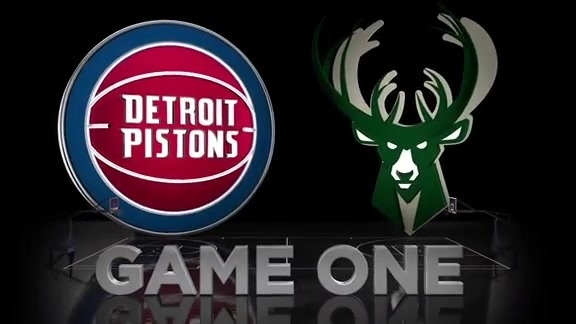 Get ready for Game 2 - Pistons vs Bucks tonight with this edition of Pistons Hits! Want a higher shooting percentage? Grab a buddy and practice this 5 Star shooting drill! 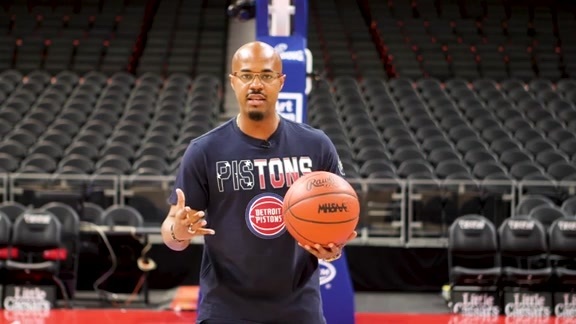 The Detroit Pistons hosted James and his family during their Autism Awareness Game at Little Caesars Arena. James was made an Art Van Furniture Honorary Captain and shown a night with one of his favorite teams he won’t forget! 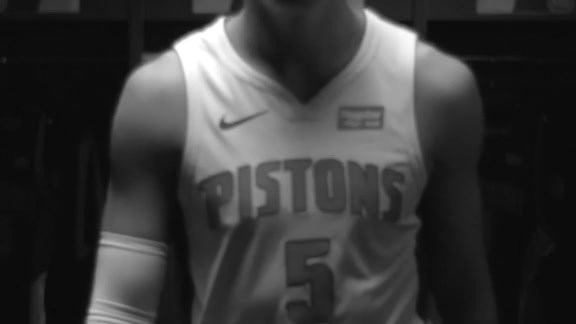 Get ready for tonight's Game 1 against the Bucks with this edition of Pistons Hits! 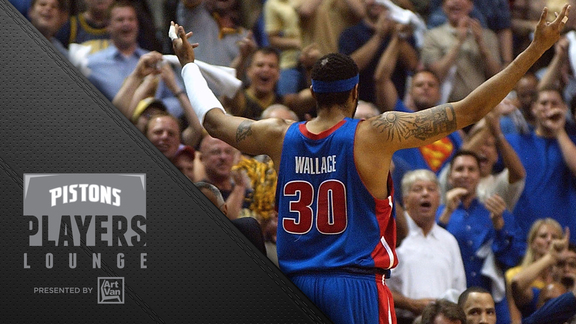 The 2004 "Going to Work" team returns to Detroit to celebrate the 15th anniversary of their NBA title in this edition of Life in the League, presented by Jeep! 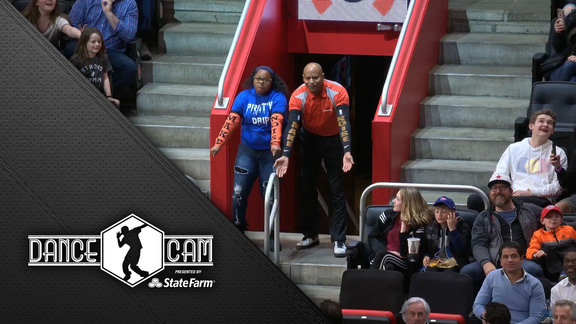 Watch Pistons fans get down and our Dancing Usher break out his moves, in this edition of Dance Cam presented by State Farm. 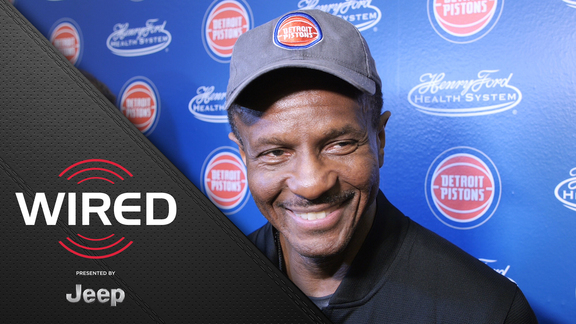 Reggie Jackson and coach Casey talk about their upcoming playoff matchup with the Milwaukee Bucks and about embracing the underdog mentality in this edition of Wired presented by Jeep! 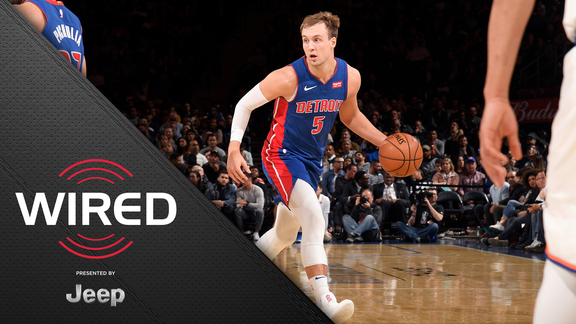 Dwane Casey, Luke Kennard and Thon Maker speak about achieving a goal of making the playoffs in this edition of Wired, presented by Jeep. 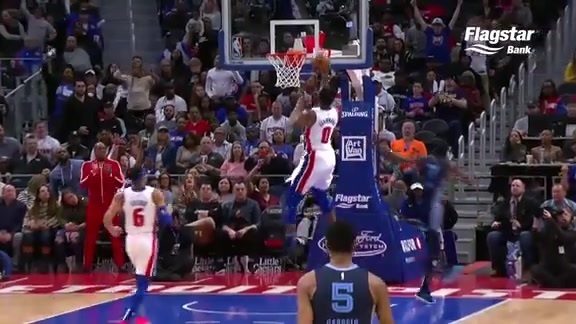 Reggie Jackson throws it up for an Andre Drummond dunk and a foul in this week’s Delivery of the Week, presented by Meijer! 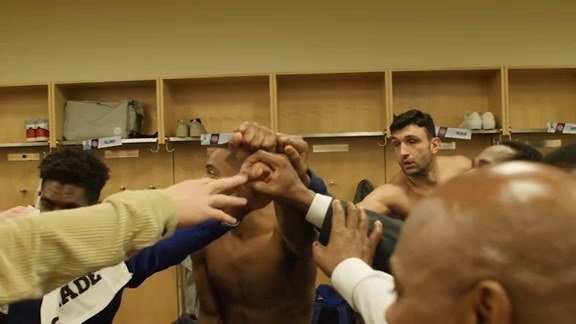 Go inside the locker room and hear coach Casey’s message to the team after the Pistons secured their playoff spot. 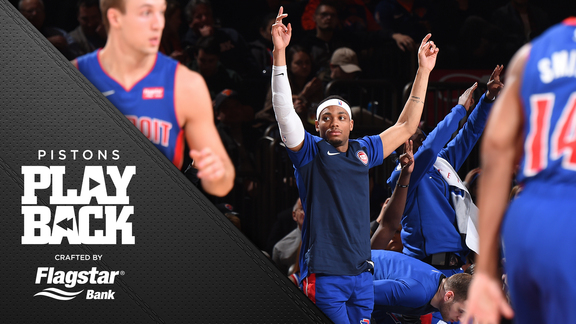 The Pistons secured their playoff berth Wednesday after a 115-89 road win over the Knicks. 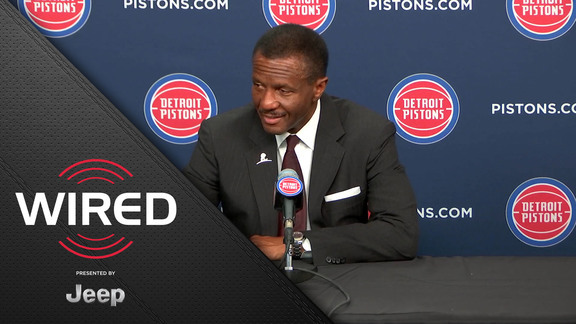 Dwane Casey, Blake Griffin, Reggie Jackson and Ish Smith talk to the media about playing hungry and finishing the game strong in last nights’ win over the Bulls in this edition of Wired, presented by Jeep! 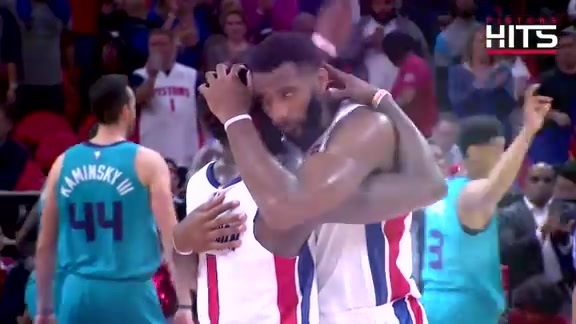 The Pistons came from behind to beat the Grizzlies, 100-93. Andre Drummond finished with 20 points & 17 Rebounds. 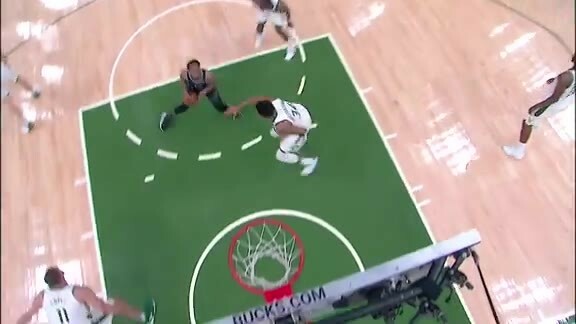 Ish Smith added 22 points off the bench. 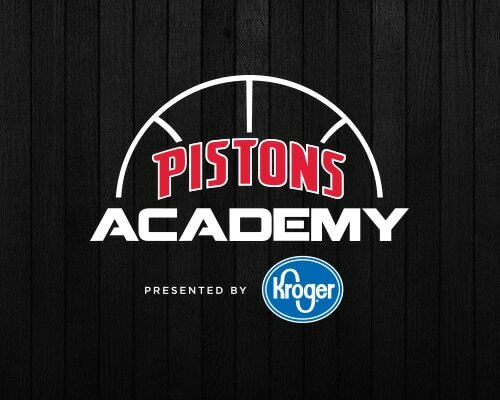 The Pistons donated basketballs to City Year Detroit to replace old ones and to use as positive behavior and good attendance incentives for students around Detroit. 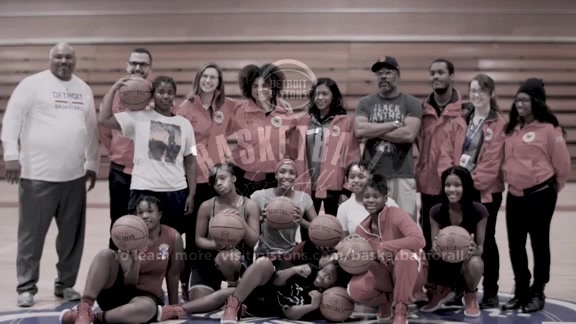 Diamond and her basketball team at Osborn High School were the first of many schools supported by City Year to receive them. 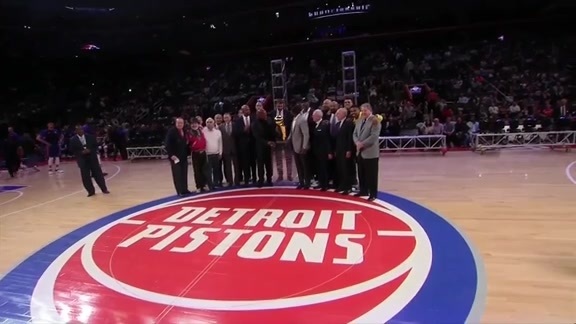 The Pistons dropped to the Hornets on the 2004 Championship Anniversary Night on Sunday, 104-91. 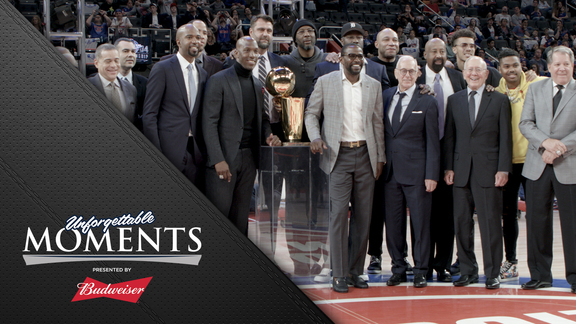 The Pistons celebrated their 2004 championship title with a special halftime ceremony, with remarks from George Blaha and Chauncey Billups. 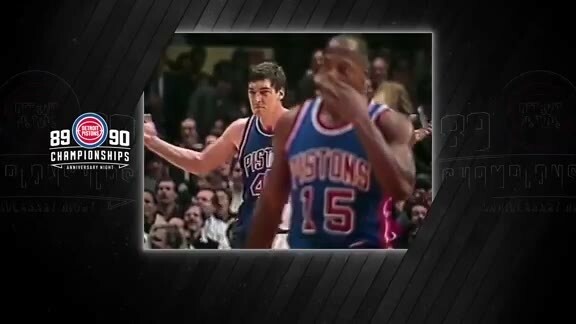 A special throwback game intro to salute the 2004 championship Pistons team. 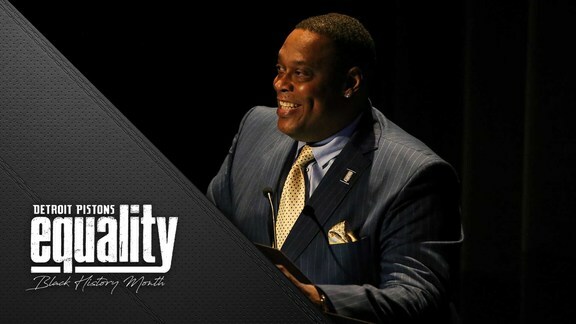 As we honor the Pistons’ NBA championship teams and celebrate the anniversaries of their titles, Rick Mahorn and Rasheed Wallace engage in a spirited debate over which championship squad would be victorious in a hardwood battle. 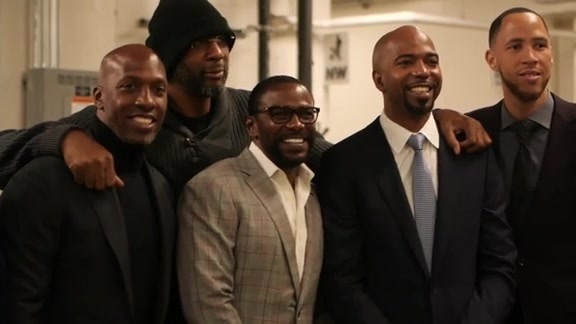 The Bad Boys were back in town on March 30th for an anniversary celebration of their back-to-back NBA Championships. Check out some of the highlights in this edition of Unforgettable Moments presented by Budweiser. 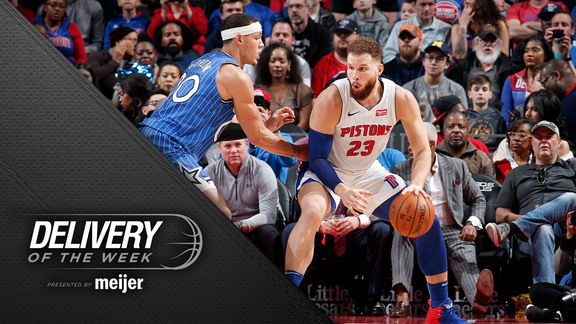 Griffin bounce passes out of a double team for an Andre jam in this week's Delivery of the Week, presented by Meijer! 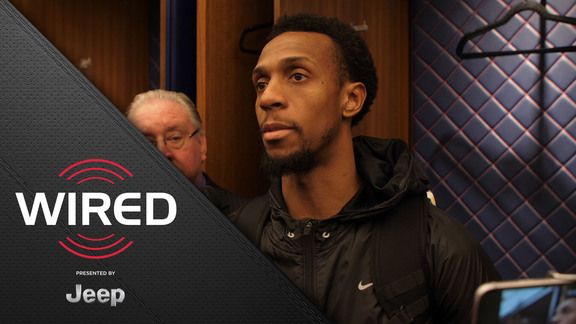 Dwane Casey, Langston Galloway and Andre Drummond talk about their focus on defense and celebrating the Bad Boys in last night’s win over the Trail Blazers in this edition of Wired presented by Jeep! 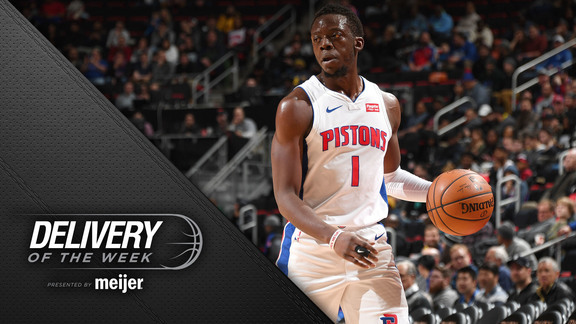 Reggie Jackson heated up in the third quarter and finished with 28 points as the Pistons overcame a cold first half to beat Portland. 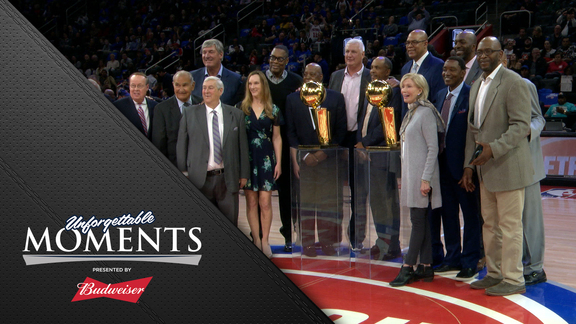 The 89-90 Championship teams were honored at halftime.